Now, over a century after the invention of the flashlight, there is finally a device that projects light directly. The EXUDE Direct Light Illuminator from Optical Dynamics. 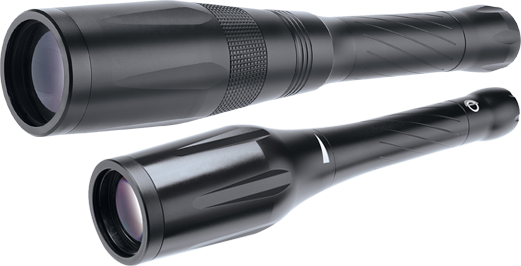 The revolutionary EXUDE illuminator features a patented Collimated Amplified Lens System (CALS)--four state-of-the-art lenses to focus and project a beam of light that is pure, clean and powerful. Unlike a flashlight, which disperses a wide cast of distorted light (which may be okay for a walk in the woods or down a dark hallway), the light from an EXUDE is a narrow beam of clean, intense white light that lets you see tremendous detail up close and at great distances. Situations in which reflected light simply does not perform well.